A chemical plant is at risk of exploding after floodwaters caused by Harvey knocked out electricity to the facility in Crosby, Texas, officials said Tuesday. Arkema Inc. said in a statement that it evacuated a small number of remaining employees from the plant in Crosby, about 20 miles northeast of downtown Houston. The Harris County Fire Marshal's Office ordered residents in a 1.5-mile radius around the site to evacuate Tuesday evening. "People are working around the clock under extremely challenging conditions, and the work thus far has been tremendous," Arkema Inc. president and CEO Rich Rowe wrote in a statement. "Right now, we have an unprecedented 6 feet of water at the plant," the statement continued. "We have lost primary power and two sources of emergency backup power. As a result, we have lost critical refrigeration of the materials on site that could now explode and cause a subsequent intense fire. The high water and lack of power leave us with no way to prevent it. We have evacuated our personnel for their own safety." "The federal, state and local authorities were contacted a few days ago, and we are working very closely with them to manage this matter. They have ordered the surrounding community to be evacuated, too." The plant was shut down since Friday in anticipation of the storm, which dumped record rainfall and caused vast devastation in southeast Texas. Arkema said 40 inches of rain had fallen at the plant as of Monday. The plant manufactures products and chemicals that must be stored at low temperatures, the company said. 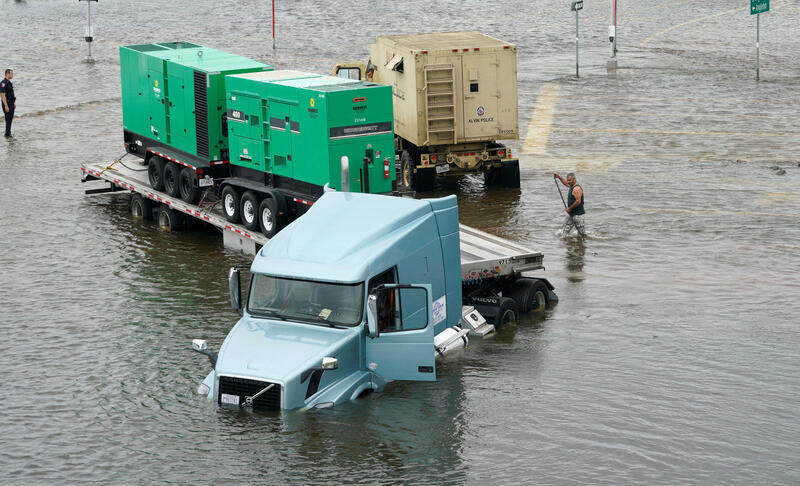 Flooding knocked out power to its warehouses, and backup generators were also compromised. Rising temperatures in the storage facilities could trigger a chemical reaction that sparks a fire or explosion, the company said. Arkema pulled out the 11 employees at the site who had stayed behind to transfer chemicals from the warehouses to refrigeration containers, saying the situation had "become serious." The company said Tuesday that it was now monitoring temperatures in the containers remotely and working with the Department of Homeland Security and state officials to set up a nearby command post. The Environmental Protection Agency (EPA) says about 1,300 households with 3,800 people live in a 3-mile radius around Arkema, CBS affiliate KHOU-TV reported. The risk of an explosion at the chemical facility highlights the ongoing environmental impact caused by Harvey's floodwaters along the Gulf Coast, home to plants responsible for about a quarter of the nation's oil refining capacity. Exxon, Shell and other companies have informed regulators that chemicals were released from plants and industrial facilities as waters rose. Shell said 100 pounds of the solvent toluene and 100 pounds the carcinogen benzene were released when a roof over a storage tank sank at a refinery in Deer Park, Texas, The Associated Press reports. Exxon reported the release of 15 pounds of benzene from a facility in Baytown, Texas, according to the EPA. Many refineries and industrial plants shut down abruptly in anticipation of the storm. Shutdowns cause emissions of large amounts of pollutants into the atmosphere, well above levels emitted under normal circumstances. Large clouds of sulfur dioxide and organic compounds can be released as plants burn off excess chemicals when shutting down, the Dallas Morning News reports. Those emissions account for the vast majority of pollutants released in the wake of Harvey. Companies along Texas' Gulf Coast have told regulators that more than 1 million pounds of emissions were released into the atmosphere as the storm caused plants to shut down, according to the newspaper. Residents have reported "unbearable" smells across Houston in recent days. Bryan Parras, an environmental activist who lives in Houston's East End, told the New Republic that residents were experiencing "headaches, sore throat, scratchy throat and itchy eyes." Another resident told the Houston Press that the air smelled "like burnt rubber with a hint of something metallic thrown in." On Wednesday, the largest oil refinery in the U.S. began shutting down its remaining operations. Motiva Enterprises said it had begun a controlled shutdown of its plant in Port Arthur, Texas, one of the areas hardest hit by Harvey.